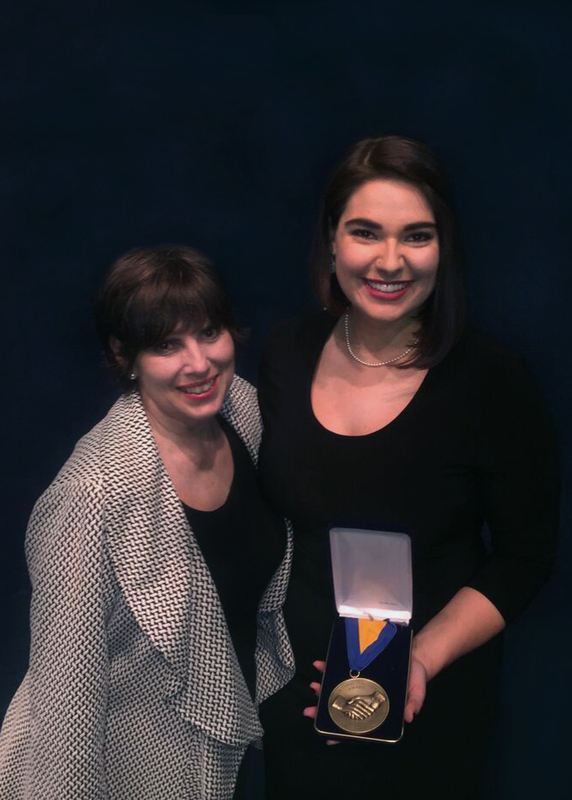 Breanna Swims, right, UA alumna and recipient of a Sustained Dialogue Institute National Dialogue Award for 2016, poses with mentor and nominator Lane McLelland, director of the Crossroads Community Center at UA and a former National Dialogue Award winner, at the 3rd Annual National Dialogue Awards ceremony, which was held Nov. 17 at the National Press Club in Washington, D.C.
Breanna Swims was recently recognized as one of three Sustained Dialogue Institute National Dialogue Award Network Winners for 2016. 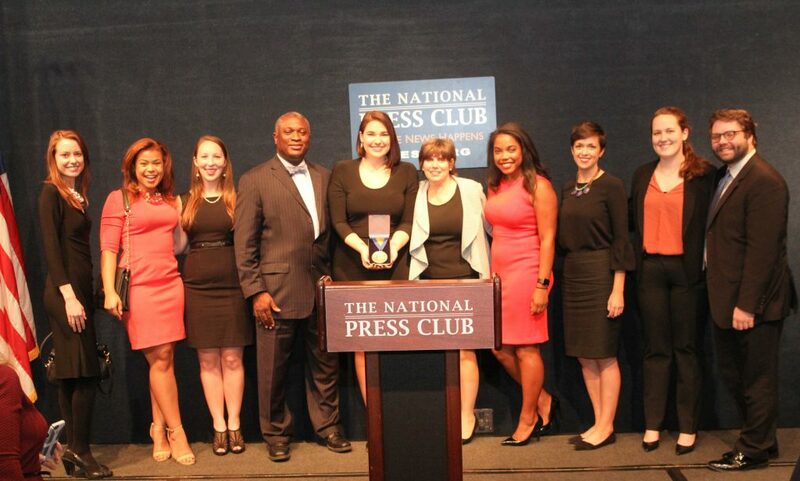 Swims, an alumna of The University of Alabama, was honored Thursday, Nov. 17, at the 3rd Annual National Dialogue Awards, which were held at the National Press Club in Washington, D.C. The awards are presented annually by the Sustained Dialogue Institute (SDI), an organization that works to improve community capacity to engage differences as strengths, while helping people move from dialogue to action. They define dialogue as “listening deeply enough to be changed by what you learn,” and utilize dialogue to help people transform conflictual relationships and design change processes around the world. Swims, a Woodstock, Georgia native who serves as a scheduler and office manager for U.S. Rep. David Scott, D-Ga., earned a bachelor’s degree in interdisciplinary studies with minors in women’s studies and Italian in 2013, as well as a master of arts degree in gender and race studies in 2015, both from UA. She first became interested in Sustained Dialogue (SD) after being introduced to the program as a college freshman. She quickly took on a leadership role as a moderator, and during her second year of moderation led her group to action by hosting the Mental Health Monologues, a student-performed presentation designed to reduce the stigma surrounding discussion and treatment of mental illness. Following the completion of her undergraduate degree, Swims accepted a position with UA’s Crossroads Community Center, where she transformed the Sustained Dialogue process to a classroom model that remains in use today. Throughout a period of two years, she taught hundreds of students how to effectively communicate across the lines of difference on a large, diverse campus. She also spent five weeks in Maun, Botswana as a graduate fellow with the nonprofit Leadership Exchange, facilitating dialogues with high school students regarding cultural differences and barriers. Lane McLelland, director of the Crossroads Community Center at UA and a former National Dialogue Award winner, in her nomination of Swims for this award, spoke of Swims’ strong questions, deep listening skills and take-action spirit as driving factors that allowed her SD group to be able to move from identifying issues affecting those who suffer with mental illness on campus to the action step of hosting the Mental Health Monologues, which were so successful that the UA chapter of the National Alliance on Mental Illness and the UA Counseling Center have taken up the charge and co-sponsored them each spring since. Following completion of her master’s degree, Swims relocated to Washington, D.C., where she serves in her current position. She continues to utilize the skills she learned in Sustained Dialogue, navigating the political climate in a way that is patient, inclusive and understanding. “Now more than ever, we need passionate leaders who desire a better tomorrow,” said Swims. “The relationship between The University of Alabama and Sustained Dialogue signifies an openness to the myriad of perspectives that young leaders must have if they want to foster true change, understanding and compassion. In addition to her professional position, Swims is involved with the Women’s Information Network, a networking group in the D.C. area. She also serves as an outreach and engagement associate for Spark Point Fundraising. She hopes to pursue a PhD in feminist philosophy and open a foundation. “I would like to thank Lane McLelland for her professional guidance, as well as Dr. Pruitt [Samory T. Pruitt, UA vice president for Community Affairs] and the Division of Community Affairs for always supporting the needs of Crossroads Community Center, which is a valuable resource at The University of Alabama,” said Swims. The awards administered by SDI recognize the work of those whose lives embody the principles and values of true dialogue, reconciliation and peace. This event serves to honor the awardees and celebrate the role of dialogue in transforming national and global conflicts. Additional award recipients for 2016 include St. Olaf College student Don J. Williams and Keynote Award Winner, U.S. Supreme Court Associate Justice Ruth Bader Ginsburg. Campus Dialogues is TODAY! See you at 1:00pm in the Ferguson Center Great Hall! Impact America is currently accepting applications from graduating seniors for their yearlong AmeriCorps service and leadership program. There will be an on-campus info session on Wednesday, April 10 at 5pm in Ferg. Room #3700! See you tomorrow morning at 8:30am! COME TO CAMPUS DIALOGUES TODAY @ 1! We will be joined by Dr. Riley, our new Assistant VP for Student Life and Dean of Students! We hope you'll join us TOMORROW for our awesome lineup of programs! We will kick the day off with our monthly Inclusive Campus Breakfast meeting at 8:30 am. We also hope to see you later in the day at our weekly Campus Dialogues at 1:00 pm! Don't forget to join us for the Inclusive Campus Breakfast meeting this morning at 8:30am in the Ferguson Center Anderson Room! TONIGHT at 5:30 pm in 205 Gorgas. Students from Dr. Hilary Green's class will present their research, exploring slavery, emancipation, and The University of Alabama. Students examined the themes of politics, education, and family during Reconstruction. Join the Center for Service and Leadership on TODAY to honor 125 Years of Women at the Capstone with an afternoon of Service! We will be making Blankets, Holiday Cards, and Packing Secret Meals!